What is Creative Commons and what does it have to do with OER? Creative Commons is a non-profit organization that allows for the legal sharing of knowledge and creativity. 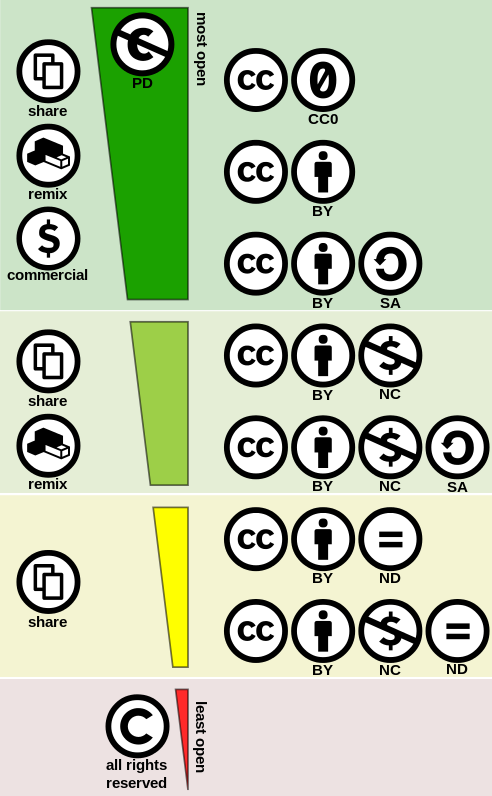 Using different Creative Commons Licenses, creators can allow their works to be shared, used, and remixed by others. The Open Education program at Creative Commons works to support the CC mission through education, advocacy and outreach on using the right licenses and open policies to maximize the benefits of open educational resources (OER) and the return on investment in publicly funded education resources. The content contained in this video is available under the Creative Commons Attribution-ShareAlike License v 3.0 (http://creativecommons.org/licenses/b...) unless otherwise stated. The work is attributable to: Victor Grigas, Wikimedia Foundation. Creative Commons works by offering different types of licenses to help creators share their work with the digital community. Each license describes how the work can be used, shared, and/or remixed. For more information on how licensing works, please see the Creative Commons site. When creating materials to share (beyond the Bb password wall), make sure to attribute CC works correctly! For digital media resources, please take a look at the links below. These resources can be used in lectures, assignments, and various scholarly applications. Each site has a licensing page with information on how to correctly use the images or videos under Creative Commons.